Caterpillar Local Host Plants: Caesalpinia pulcherrima (Fabaceae, common name: Peacock Flower ), Cratoxylum cochinchinense (Hypericaceae, common name: Yellow Cow Wood), Cratoxylum formosum (Hypericaceae, common name: Pink Mempat), Pithecellobium duice (Fabaceae, common name: Madras Thorn), Falcataria moluccana (Fabaceae, common name: Albizia), Senna spp. 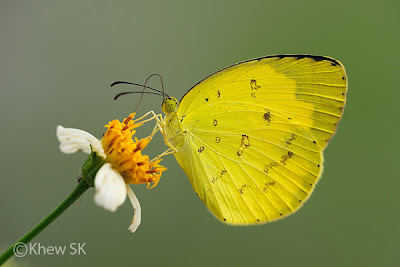 A Common Grass Yellow taking nectar from a flower of Leea indica. A Common Grass Yellow resting at a leaf perch. Above, the wings are deep lemon-yellow, each with a black border which is regularly scalloped and deeply excavated between veins 2 and 4 in the forewing. Below vein 2 of the forewing, the black border is featured at a right angle to the dorsum or sloping towards the base. Underneath, the wings are also yellow with freckled brown spots. There are typically two cell spots on the forewing - a characteristic that is mainly used to identify the lookalike species in the genus. 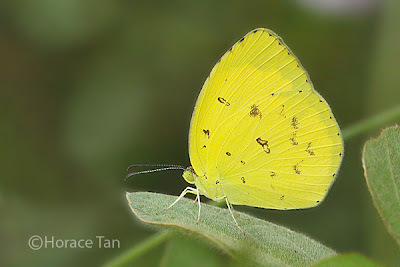 However, some specimens of the Common Grass Yellow could exhibit variations in which only one or no cell spots are present. Males have a brand lying along the cubital vein on the forewing underside. 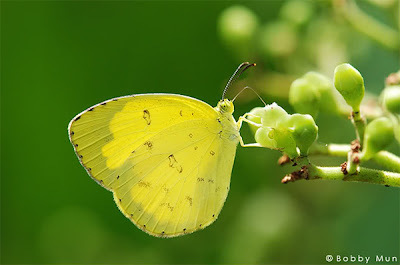 Females are typically paler yellow with broader black border. 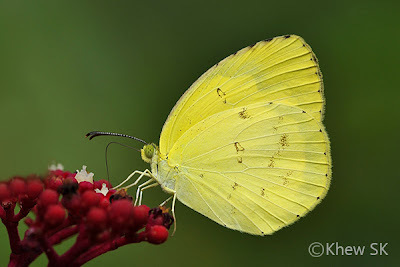 Another resting Common Grass Yellow. A Common Grass Yellow taking nectar from a flower of Leea rubra. 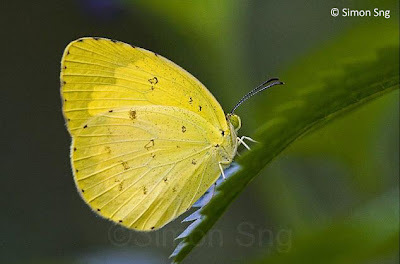 Common Grass Yellow is one of the most common butterflies in Singapore. This is likely due to its many host plants being common in the wild or widely cultivated in parks and other public areas. The adults can be seen fluttering tirelessly in parks, wastelands and even urbanised areas. They regularly visit flowers for nectar and puddle on wet grounds for minerals.